NOW ACCEPTING RESERVATIONS FOR PHILMONT 2020! STILL HAVE SPACES AVAILABLE FOR PHILMONT 2019! Philmont Scout Ranch provides an unforgettable adventure along its hundreds of miles of rugged, rocky trails. Program features combine the best of the Old West—horseback riding, burro packing, gold panning, chuckwagon dinners, and interpretive history—with exciting challenges for today—rock climbing, burro racing, mountain biking, and rifle shooting—in an unbeatable recipe for fast-moving outdoor fun. 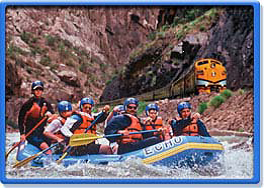 Some of the Blue Sky Adventures Tour consists of a visit to the United States Air Force Academy, Climbing Pike’s Peak, and white water rafting down the “Royal Gorge” section of the Arkansas River. It doesn’t get any better than this before the amazing Philmont Trek. WHERE: Philmont Scout Ranch is the Boy Scouts of America’s largest adventure base covering 137,500 acres nestled in the mountains surrounding Cimarron, New Mexico. WHEN: 2019 and 2020 - Northern New Jersey Scouts will have the opportunity to embark on the adventure of a lifetime! WHAT: An adventure at Philmont will be one of the most incredible experiences of your lifetime. During a Rocky Mountain Philmont Adventure Scouts will have the chance to choose the itinerary for their adventure. 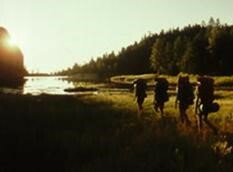 They will hike 50 miles within the mountains sharing in breathtaking views and accomplishments. Scouts may choose from 35 itineraries similar to the sample itinerary provided on the back of this flyer. Program features combine the best of the Old West—horseback riding, burro packing, gold panning, chuckwagon dinners, and interpretive history—with exciting challenges for today—rock climbing, burro racing, and rifle shooting—in an unbeatable recipe for fast-moving outdoor fun. WHO: To attend Boy Scouts must be 14 years old OR have completed the 8th grade and be at least 13 years old. All participants must meet the Boy Scout Height and Weight requirements. Your Scouts will be attending with leaders from the Northern New Jersey Council. COST: The cost for the adventure will include food, training, Philmont programming, and travel expenses. Our council contingent will cost each Scout approximately $2,600. Scouts and their parents will have the opportunity to give input as to which adventure the Scout would like to participate in. There are a limited amount of spots open to attend, after our limit is met Scouts will be put on a wait list. To hold your spot, a non-refundable $200 that will go towards the overall cost. We are currently accepting reservations for Troops or Venturing Crews that are interested in attending Philmont July 8-20, 2019 with a 2 day excursion beforehand leaving on July 8th. Participants should expect to leave early morning on July 6, 2019. We have 3 crews of 12 participants for a total of 36 spaces for our Contingent. Please let Chris Clark know if you are interested ASAP. Cost is estimated at $2,650 per person. This includes the Philmont Fee, Blue Sky Adventure Tours Fee, Airfare, All Meals, Busing to and from Airport, and all Liability. The first deposit of $200.00 will be due when signing up which is non-refundable but is transferrable. Due to the closure of Philmont for 2018, We are trying to accomodate our participants that got cancelled in 2018! We only have 3-6 spaces available on this contingent! If you have any questions or want to add your scout(s) to our waiting list for 2019, please contact Chris.Clark@scouting.org. We are currently accepting reservations for Troops or Venturing Crews that are interested in attending Philmont July 30-August 11, 2019 with a 2 day excursion beforehand leaving on July 28th. Participants should expect to leave early morning on July 28, 2019. We have 2 crews of 12 participants for a total of 24 spaces for our Contingent. Please let Chris Clark know if you are interested ASAP. Cost is estimated at $2,750 per person. This includes the Philmont Fee, Blue Sky Adventure Tours Fee, Airfare, All Meals, Busing to and from Airport, and all Liability. The first deposit of $200.00 will be due when signing up which is non-refundable but is transferrable. Due to the closure of Philmont for 2018, We are trying to accomodate our participants that got cancelled in 2018! We currently have 3 spaces available on this contingent! If you have any questions or want to add your scout(s) to our waiting list for 2019, please contact Chris.Clark@scouting.org. We are currently accepting reservations for Troops or Venturing Crews that are interested in attending Philmont July 8-20, 2020 with a 2 day excursion beforehand leaving on July 6th. Participants should expect to leave early morning on July 6, 2019. We have 3 crews of 12 participants for a total of 36 spaces for our Contingent. Please let Chris Clark know if you are interested ASAP. Cost is estimated at $2,800 per person. This includes the Philmont Fee, Blue Sky Adventure Tours Fee, Airfare, All Meals, Busing to and from Airport, and all Liability. The first deposit of $200.00 will be due when signing up which is non-refundable but is transferrable.